(13 JUNE 2018, FRANKFURT): Startup Genome’s latest report on Frankfurt’s startup ecosystem has found that the Frankfurt Rhein-Main region can triple in size as a startup ecosystem, creating new jobs and billions in economic value—if the area’s world-class universities and corporations fully leverage their strengths to help startups become scaleups. "Capitalizing on its strengths in international finance, the Frankfurt startup ecosystem is growing rapidly and showing the culture of a thriving community,’’ JF Gauthier, CEO of Startup Genome, explains. “We are proud to join TechQuartier and Goethe University in clarifying the key focus areas for leaders to build on momentum,” he adds. Startup Genome’s ‘Frankfurt Startup Ecosystem Report’—commissioned by Goethe University, alumni and serial entrepreneur, Yi Shi, and local startup hub TechQuartier—identifies Frankfurt as in the Activation phase of the Ecosystem Lifecycle. While still relatively small in size, Frankfurt’s startup ecosystem already has a strong culture of founders helping founders (measured as Sense of Community), which contributes to the growing vibrancy. Frankfurt founders also have higher Global Connectedness than in peer ecosystems. To continue globalizing and growing as an ecosystem—as envisioned by the region’s Masterplan—the region’s large corporations and world-class universities will be key sources of leverage. The new report also includes analysis of factors that differentiate scaleup firms from non-scaleups, dispelling several myths about what drives their creation. Scaleups, defined as companies that achieve a $50 million valuation within 10 years of founding, drive economic impact in cities and regions. These firms are characterized by founders with higher levels of global ambition and greater levels of prior startup experience than firms that have not scaled. 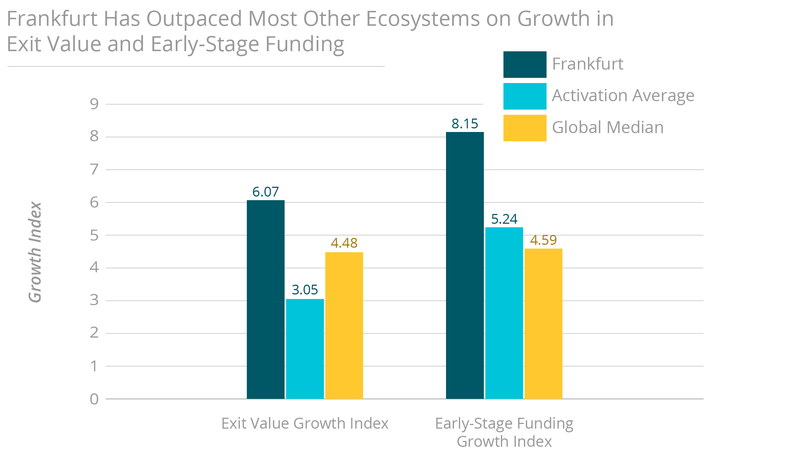 Global ambition among founders can increase with higher Global Connectedness, and Frankfurt is ahead of most other Activation phase ecosystems in connections to top ecosystems. But that Global Connectedness has not yet translated into greater ambition: founders in Frankfurt and other Activation phase ecosystems do not target global markets to the same degree that founders in places like Helsinki do. 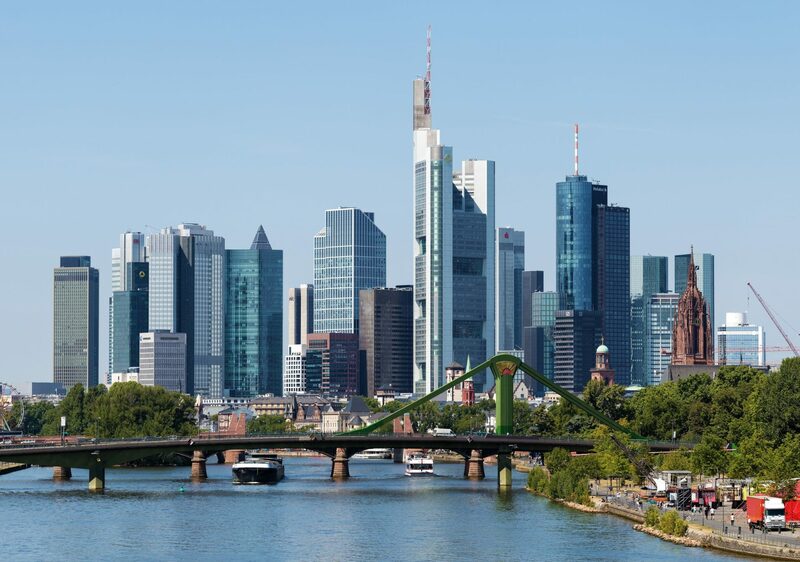 The question for a place like Frankfurt is: can universities help raise the sights of burgeoning founders, and can multinational corporations help connect them to markets beyond Europe? ’’The report highlights the importance of attracting international talent, as well as improving the effectiveness of university entrepreneurship programs. We firmly believe in doing both. As we finalize our own in-depth study on talent and scaleups to be published in the fall, we continue solidifying our ties to the local startup ecosystem, as well as other universities’ entrepreneurship initiatives,” said Prof. Andreas Hackethal, Dean of Programs at Goethe University and Academic Director of the Goethe-Unibator startup center. “Over the past few years, I’ve traveled extensively across the world and discovered different mindsets, different methodologies that impacted how businesses are built and scaled. My intention to support this study, together with my alma mater, is to systematically analyze the macro and micro economic factors of building a successful startup ecosystem, in order to get a deep understanding of which measures could be done better by different stakeholders inside of the system,” said Yi Shi on what drove the study. Click here to download Startup Genome’s full report on the Frankfurt Startup Ecosystem.